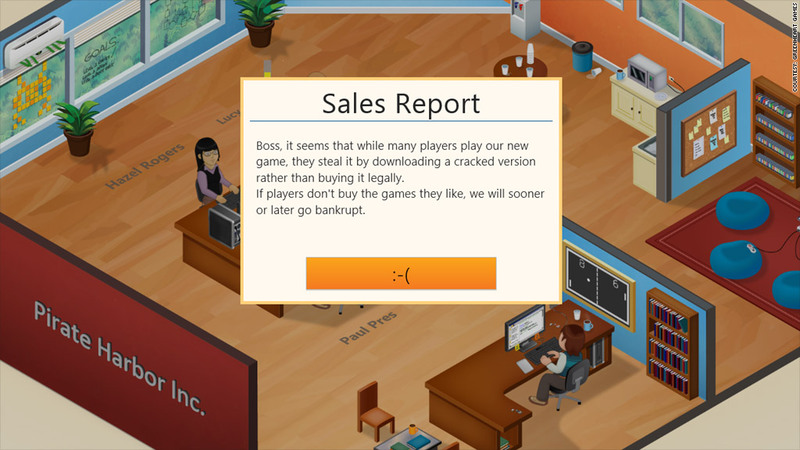 The makers of "Game Dev Tycoon" turned the tables on those downloading their game from notorious piracy site The Pirate Bay. An indie video game developer is drawing attention to the industry's rampant piracy problem with an ingenious stunt: The company pirated its own game -- and added in an ironic kicker. Greenheart Games, a small Australian gaming company run by two brothers, released its first title, "Game Dev Tycoon," over the weekend. The $8 game (available for Mac, Linux and Windows computers) lets players simulate running a video-game development company. The goal: Craft a few bestselling hits and get rich. Greenheart's operators simultaneously uploaded a copy of their game to The Pirate Bay, a notorious piracy site through which users frequently swap "cracked" games that evade copyright protections. It was an instant hit: Within a day, more than 3,000 people had downloaded and played the pirated copy. That version had a nasty surprise waiting. After a few hours of play, those running the pirated game start to see messages about the toll that illegal downloads are taking on the company's sales. "Boss, it seems that while many players play our new game, they steal it by downloading a cracked version rather than buying it legally," reads one sales report. "If players don't buy the games they like, we will sooner or later go bankrupt." That's exactly what happens. In a blog post, Greenheart Games founder Patrick Klug described the pirated game's inevitable conclusion: "Slowly [the players'[ in-game funds dwindle, and new games they create have a high chance to be pirated until their virtual game development company goes bankrupt." Poetic justice. Klug said he and his brother devised the stunt to illustrate how economically devastating piracy can be for game developers. The stunt converted at least a few of its victims. Several pirate players stopped by Greenheart Games' discussion forum to report that they'd become paying customers. "I wanted to let the team know that yes I did play the cracked copy, loved it, saw it was only $8, and whether or not I ever even start the game up again I figure the enjoyment I got just last night was worth it," read one post on the site. But illegal players vastly outnumber those paying for the game, Klug said. In his blog post, he reported a piracy rate of almost 94%: Greenheart's servers detected 3,104 players of the pirated game versus just 214 buyers of the genuine article. Klug's post generated dozens of stories on tech and game development sites -- a wave of coverage that crashed Greenheart Games' website several times on Monday. The attention lifted the game's sales a bit, Klug told CNNMoney. "We definitely had a big show of support and interest but we still have long way to go before we can be profitable and confident about our future," he said in an email to CNNMoney. The cracked version of "Game Dev Tycoon" is no longer available on The Pirate Bay. "They took it down, which is quite interesting in its own right since they never take anything down from legal take-down notices," Klug said.